Yesterday we ran an interesting email campaign, we decided to add some A/B testing into it in order to optimise for ’email openings’. The title of this site is “Smarter IT” and we wanted to apply that to how we send our emails. You should be watching closely the percentage of opens to your campaigns. With MailChimp you are able to run A/B tests to a subset of your list, and depending on the results you can automatically send the better performing one to the rest of the list. By default MailChimp recommends you send the two versions to 25% of your list, and send the remaining amount to the better performing version. Sadly these A/B campaigns only differ in respect to the email subject and you can only test 2 subjects at a time. Why are you sending emails ? 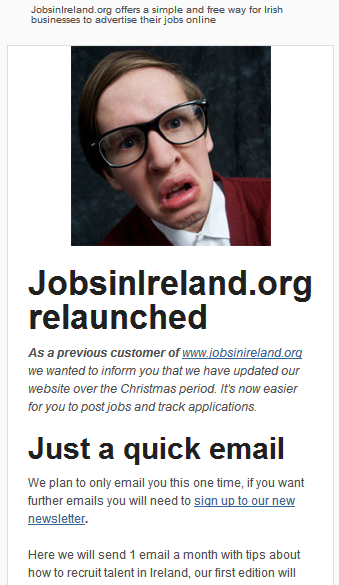 We had recently relaunched JobsInIreland.org and we thought it would be a good time to touch base with all our previous customers. We’re not in the business of sending a lot of emails just for the sake of it. When we send a campaign we want to provide some real value to our customers. Before sending any email campaign I encourage you to think about your main goal(s) for sending it. If you are repeating yourself from a previous email, it’s better not to insult your reader for assuming they didn’t read your first email. If it can be merge with a later email, then you are probably better off just wait and to join the two emails together. There is a balance, as you want to make something short enough and too the point, so that the users’ attention is held, and they will perform the actions you want. Wasting customers time is one sure way they will hit that dreaded ‘unsubscribe button‘, and after going to the trouble of getting them on your list, you want to keep them there for as long as possible. Open and unsubscribe rates are two of the main quality factors in your list, you may need to reconsider your email campaigns if there is a sudden dip in this quality. Sending an email campaign is one sure way to get people to unsubscribe from your list. People generally don’t search back in their emails 3 weeks to fish out your email to click the unsubscribe link. Unsubscribing is a quick gut action, and it’s the harsh reality every time you send an email. Our goal was to do all this in under 300 words (in fact we managed only 232 words). Here we wanted to have a stark contrast between the titles, one showing something more positive than the other. You could say it was more to shock the audience, but at the end of the day, you want people to open the email, and take action and hopefully interact a little. While it’s not a significant difference, on our list size this should result in an extra 40 users opening the email, when the rest of the list receives it. Digging further into the numbers I can see that users who opened the email about us being closed, where 87% more likely to click a link email where we said we had closed. So it’s just not the fact that someone opens, it’s clear here that the users’ interest has been has been piqued. A/B testing is a game of inches, little changes can make a small difference, but ultimately they will pay off and have an effect on your bottom line. If you need help making your email campaigns a little more awesome our email campaign help might be the thing for you.